Have you ever had problems with duplicate SRV records in your environment? This is a quite common phenomenon when you google it without any real solution to it (not at least what I could find). Some environments would not be affected by this, but I got into a specific situation recently where some workflows in Nutanix would fail because of duplicate SRV records. Duplicate SRV records, one in lower-case – one in upper-case, are causing some workflows in Nutanix to fail. When deleting the oldest record the duplicate is just recreated after some period of time (like 30 minutes or so). So whats cousing this? In this specific case we managed (together with Microsoft support) to isolate the issue and found out that there were two main things that were related to this behaviour listed below. Some Domain Controllers names were in lower-case, others in upper-case. When you have a mixture of DNS servers running Windows Server 2012 and 2016 the way that machine names are registered differs between those Windows versions. After doing this the duplicate SRV records stopped being recreated in the environment. The preferred way to solve the issue is to rename all domain controllers to lowercase (or uppercase which works too). Once more it was time to upgrade our SCCM environment to the newest release that is 1806. As it was not released for everyone yet, I had to run the Fast-Ring script to allow the update to present itself. I found this update very interesting as it comes with some exciting new features, and there are alot. These are the ones that I am most excited about. …and much more. You can read about all the new features here on Microsoft docs. Since there are a lot of news, I have chosen to cover the two that I am most excited about in this new release. Configuration Manager is a very helpful tool when gathering information, CMPivot now allows you to take it to the next step by real-time querying clients. This allows you to gather a lot of information instantly. This feature uses Azure Analytics Language, . CMPivot is located under Asset and Compliance > Overview > Device Collection, you can find this new feature in the top ribbon bar. An example is to find BIOS-information about the Dell computers that are currently online. From this output you easily create a collection (the members of the collection will be added as Direct Members) or export to both CSV and Clipboard. It is exciting to have a new way of deploying over PXE. Since Windows Deployment Services has been available for a long time, it feel suitable to have an updated way of deploying clients. 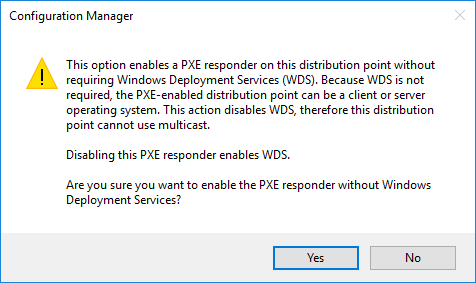 By replacing WDS, the distribution point will create the service ConfigMgr PXE Responder. If you have plans of using Multi-Cast, you are for now stuck with WDS. This setting can be found under Administration > Overview > Distribution Point, right click on the distribution point you would like to modify with the setting shown below. 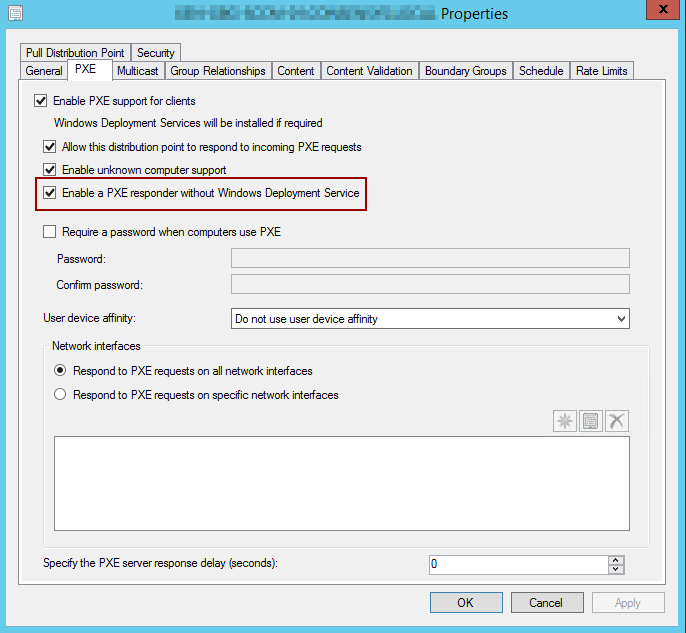 After applying this setting, Windows Deployment Services will automatically be disabled. Be advised that if you are monitoring this service, it will be report as stopped. If you have questions, thoughts or anything you would like discuss? Send an email to Johan.Nilsson@xenit.se and I will be more than glad to talk about these topics. Before i start with the how, I’d like to address the why. If you’ve ever done some coding you’re sure to have encountered issues with datettime and possibly errors and incidents due to the timeformat of a datetime string. For example, if I live in the US then time is commonly written in month-day-year format, which during the first 12 days of each month is indistinguishable from the european day-month-year format. This is also encountered in code, for example in powershell my locale is Swedish and the “Get-Date” cmdlet returns “den 1 augusti 2018 16:35:24” which is easy and readable for a human. However if i convert it to a string it becomes in US format even though my culture settings in powershell is set to swedish. In my opinion this behavior is wrong as I expect to be given a ISO standard universal format, or at least a culture appropriate format. Instead I am given a US format. With that said, developing automation and tools for global customers a standard format is much needed when we write to logs. After a short time on google it seems no one had done this properly in powershell. I also found out that XML is RFC compliant. Great! Now let’s put it into some real code. The output becomes a RFC compliant string and gets stored in the $now variable to be used into a out-file log operation. Here we create a datettime object, add 20 hours and then convert it to a RFC compliant datettime string and store it into the $RFCDeadline variable.